RPGs are ripe with ways to derail a game session. A funny scenario, or a daring stunt that actually works can side-track the whole table for a large chunk of time. But these are good distractions. They keep everyone invested and immersed in the game even while the table is talking about what just happened rather than moving forward in the game. Today we’re going to be talking about the bad type of distractions. Ones that pull everyone out of the game and break their focus. Basically, anything that breaks the table’s immersion in the game and bogs down the session. It’s inevitable to have a few bad sessions in a game. Maybe the GM didn’t spend enough time and effort preparing or maybe the table is just having an “off night”. It happens. The problem is when this happens too often or it’s because of something that’s easily fixable. Try your best to get everyone to limit unnecessary use of their phones or electronics. It’s annoying as a player to have someone playing around on their phone and only once in a while joining in on the game. As a GM it can be demoralizing since it feels like they aren’t interested in the game you’ve worked hard to create. But it’s also 2018 and we don’t always play in person with paper and pencil. 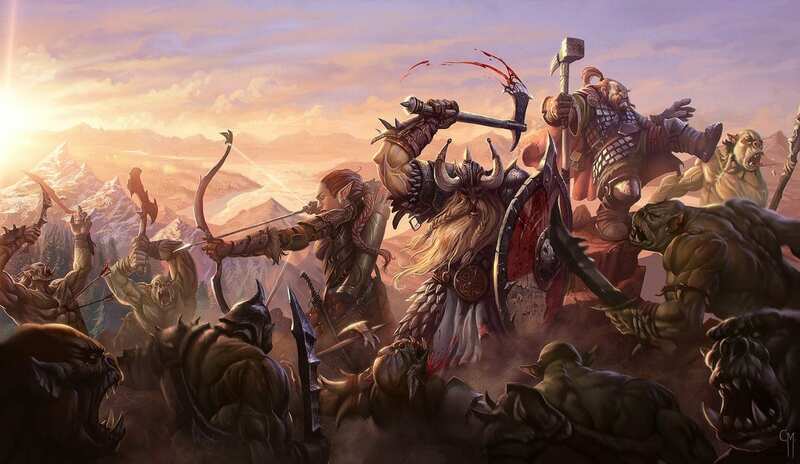 With things like D&D Beyond and Roll20 becoming popular options for character sheets or virtual tabletops “put the computer or phone” away isn’t necessarily an option. Instead, you could just not use your computer or device for stuff other than what’s relevant for the game. Emergencies happen too so asking people to shut their phones off isn’t something I’d recommend. Maybe mute notifications other than important phone calls, but all you really need to do is just regulate yourself. Don’t get distracted, you never know what lurks in the shadows! Art by Caiomm. This is a tough one since at least for my group our weekly D&D sessions are one of the few times nowadays where we can hang out together even though we play online. It’s nice to catch up, vent about work, etc., but we also want to actually play the game that we’re there to play. We’ve combated this a few different ways, but primarily it was to set our start time back about 15 minutes. That gives everyone a bit of extra time to get there, and a good chunk of the group ends up ready at 8 so we just chat for a few minutes. While it cuts into our game time it helps substantially with the pacing, though there weren’t many issues there to begin with. We also tend to talk for a little while after the games. Everyone associates these two times with “chill time” and not “game time”. I think that compartmentalizing of our sessions has helped a lot with regulating off-topic talking. Do your best to keep yourselves from spurning into an off-topic discussion in the middle of the game. These are the kinds of things that can derail an encounter and just make it take considerably longer than it should. Making an out of character joke is awesome and can be one of those things that help with immersion. Making a lot of out of character jokes or references can easily do the opposite. Know your audience and what your group is capable of. This is a big one for cutting down chatter during your sessions. Like I already mentioned with my group having before and after the games as “chill time”, scheduling a 10-minute break can be a lifesaver for your sessions, particularly if they’re long games. Personally, I’d say to pencil in a 10-minute break around every 1hr 30min to 2hrs. Even if no one needs to do anything during these breaks the time to have some idle chatter and let the GM look over their notes can be a blessing in it of itself. My typical session runs at about 2hrs 45min to 3hrs max, but we still have a 5-10 minute break. It gives the whole group a bit of time to get up, get a snack, get a drink, and come back more focused for the rest of the game. Sitting in place for that long can hurt your focus and potentially break your immersion because of that. I mentioned in my post about the ideal party size in D&D 5e that I hate having groups of more than 6 people due to how much it slows down the game. Not every RPG has this issue, but most that I’ve played definitely have that sweet-spot of 3-6 people. A lot of times though it’s not the number of people who are playing the game that slows down stuff like combat, it’s the players themselves. This can be the talkative person at the table that is always side-tracking people, but we’ve already talked about what to do to help that situation. It’s the people who don’t know what they’re doing that are the real culprits here. I don’t mean new players though, they get a pass. I mean people who aren’t paying attention or need to learn the game a bit better. Depending on the system this can be a sizable request for a person. You don’t need to memorize every spell or ability that you have, but you need to at least have a rough idea of what everything does. Think of it this way, someone is going to have to know what your spell or ability does and that is probably going to fall on the GM if you don’t. As the GM you have to remember what your creatures and NPCs are doing and a ton of other stuff. You’ll probably resort to picking up the book and flipping through it. That takes time and that’s time that everyone is spending waiting around while you decide if the spell or ability is actually worth even using. This is where people lose their focus or interest in an encounter which can lead to people derailing the encounter altogether if it takes too long. That being said, if you’re someone who isn’t great with memorization or you prefer to reference the spell descriptions a good trick is to write down the page number of the book that the spell or ability is on. Write a bare-bones description on your sheet and if that doesn’t jog your memory you can flip to that page quickly. Don’t slow down an intense moment because you weren’t ready to take your turn! Art by Cloister. I love people who do this. Planning out your turn ahead of time gives you plenty of time to make a good, tactical decision without holding up the rest of the game when it’s time for you to go. The biggest benefit of planning your turn in advance is that you are incentivized to stay focused on what everyone is doing during combat. Your plans and tactics will change as the battlefield changes, and you may even come up with a better idea if a new situation arises just before your turn. It’s easy to zone-out while other people are talking and making moves in part of the encounter that doesn’t directly affect you. However, planning out your turn will help to combat this and keep you focused and immersed in what is going on. Getting in the habit of planning your turn out beforehand also gives you plenty of time to look up your spells, abilities, or any rule that will come into play on your turn. This will not slow the game down at all, in fact, it will speed it up since you’ll be completely ready to act by the time it’s your turn in the spotlight. 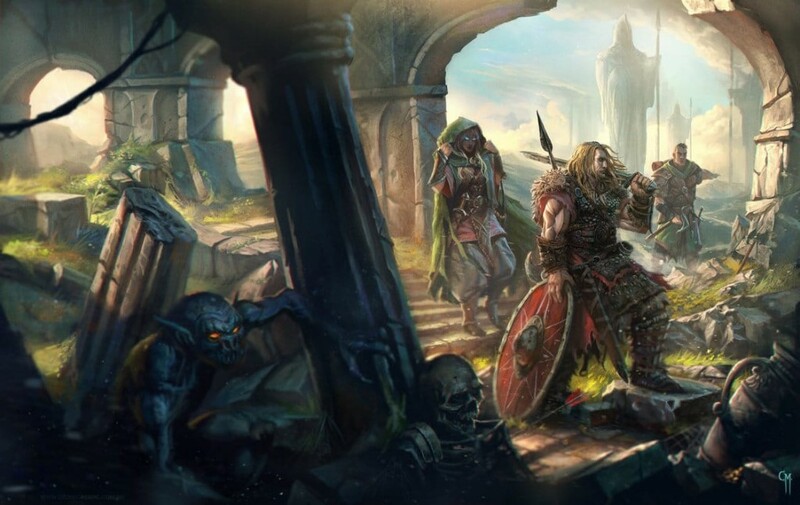 Downtime can be a necessary evil in RPGs. It gives you time to work on long-term plans and shop around for supplies for upcoming adventures. Sure you can speed it up so that weeks of game time can be covered in a few minutes, but that doesn’t always make narrative sense. Part of this is because goofing off in the city or around camp at night can lead to some of the best role-playing moments. You just need some sort of prompt to get role-playing to happen. As the GM you have plenty of hooks, NPCs, and surprise encounters that can encourage this. Players can spark these moments as well during downtime. Interact with the other party members, cause some shenanigans, and try to explore the world around you. Downtime or lull periods in the story are what you make of them. They’re a time for your characters to take a breather and get ready for the next adventure, but they don’t have to be boring. 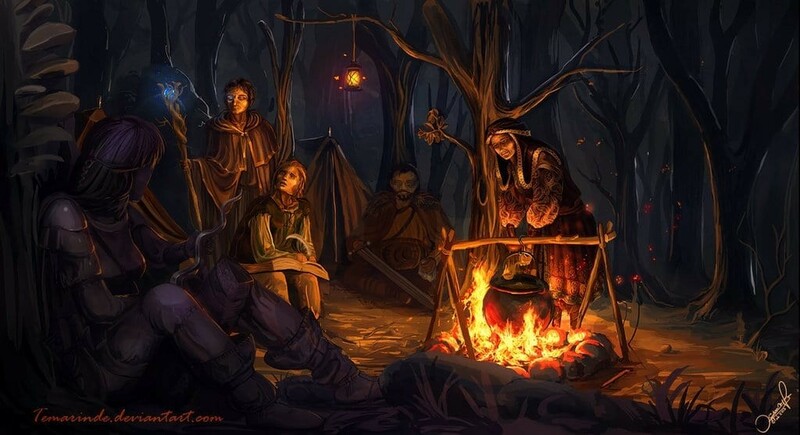 Encouraging role-playing can make the world feel alive and invest the players in the game even more. Even the quietest of nights by the fire can make for the best role-playing moments. Art by Temarinde. One way to get a player to lose their focus or investment in the session during a period of downtime is to not involve them enough. Sure you and another part of the table might have a very fun activity or conversation happening, but for those that aren’t involved, it’s probably not nearly as interesting or engaging. People like to feel involved, and when they’re not they tend to zone out, look at the phones, or become distracted in some other way. While it’s not great table etiquette, you can’t really blame someone for losing focus when they’re sitting there listening to other people having fun. As the GM it’s important to learn when you need to switch the focus to a different player or group of players. This keeps everyone involved since everyone has a reason to engage in the game. When it isn’t their turn to interact with the game they’ll be busy thinking of what they’re going to do next and will be more attentive to the current group’s happenings since they’re focused again. Personally, I try to keep a hard switch time at around 15 minutes. I’ll try to make it so that either a whole interaction will happen or a climax has been built. Climaxes are sometimes the perfect times to switch because the tension has been built. The players involved in the scenario that’s reached its climax are super focused and the other players are now interacting with so everyone is going to be interested in the game. Your players probably have some sort of backstory written for their character. Be sure to use these and incorporate them into the world and story! Think of this as a call-out for the player. It shows them that you appreciate the effort they put into their character. It also gives the player a reason to be invested in whatever is going on in the game that revolves around their backstory. Their character probably knows some additional information about what’s going on. You can lean on them to help you worldbuild because of this. Getting players more involved in worldbuilding or storytelling is a sure-fire way to keep them engaged. Session 0’s are extremely helpful for getting the ball rolling with regards to connecting PCs’ backstories to the rest of the game. Have your players describe where they came from and what their part in the world was before joining the party. Get everyone involved! Games are the most fun when everyone is playing. Art by Caiomm. This advice sort of circles-back to the “switch back-and-forth between players” section that we’ve already covered. You should always be trying to involve everyone at the table throughout the session. Instead, think of this advice as encouraging a shy player to get more involved. Ask them how their character feels about the current situation or what they’re thinking about right now. Give people who aren’t comfortable with speaking up – but want to – a way to get into the conversation. You should also be sure to check in on your players after the session. See what they liked, what they didn’t like, and what they would like to do. Adding more elements that the players enjoy ensures that players are focused on the game and immersed in the world. At the end of the day, no one is perfect. There are plenty of behaviors that I’ve described in this post that I have trouble keeping in check with myself. I definitely get distracted easily which is even more of a problem since I play entirely through Roll20. It’s something I’ve had to work on, but I’m getting better. Use these techniques to help yourself and the rest of your group stay focused during your sessions. Ultimately though a lot of these are band-aid fixes. It’s up to yourself or your friends to recognize their behavior and take steps to correct it if it’s a major problem for your group. Do your best to be involved in the game and minimize outside distractions. If you enjoy the time spent with your friends and have fun playing in your session most of this will come naturally anyway.